Gmail finally rolls out offline access as a lab feature. You need to enable Gears to access this feature. After downloading and installing Gears, go to Setting tab in the Gmail, click on labs tab and enable offline feature. “Created in Google's Gmail Labs, offline access will enable Gmail to load in a Web browser without a Web connection. Users will be able to read, archive or write messages. Users can hit send on composed messages, which will remain in the Gmail outbox. When the user's computer reconnects online, Gmail will push the messages from its queue toward their recipients.”Rajen Sheth, senior product manager for Google Apps, told eWEEK before the launch Jan. 27. If Google enables offline access to it’s calendar service also, then there is no need for separate email and scheduling clients like outlook, outlook express and thunderbird. This would further strengthen Google to expand it’s user base and bulldoze it’s competitors. Buy NTPC. Try to accumulate this stock in declines. In this uncertain times, this company seems to have good potential. Recent changes in the rules immensely help NTPC to get more profits. Satyam players should buy and trade with strict stop loss. 3) Demat a/c is compulsory for investment. Satyam has become a great trading candidate. Though the fundamental position is still unclear, recent developments ensures great volatility with upside bias. Buy with strict stop loss. All my earlier write-up on ICICI Bank, HDFC and Reliance turned out to be correct. Though analysts are divided on opinion about Reliance’s performance, I think the next two years, Reliance would not able to grow as it was. It’s huge cash positions and political lineage can’t help much either. Closely watch the price movement of Reliance. Investchips expects some negative news from Reliance. That news may trigger re-rating of business model of this company. It may sink along with other cyclical commodity companies. Investchips also have a strong negative view on ICICI Bank. Their credit card business may turn out to be as their huge liability. It also sprung negative surprises in next year. In medium term it would go down. Private housing financing companies may see pressure on their margins and growth. Better avoid. Past Glory may not help them. Book profit in HDFC. We are positive on Axis Bank. It can be accumulated in declines. It has the potential to give 30-40% annual returns over next 3 years. - Select the bank from which you would like to make your ICICI Bank credit card payment (allowed banks as given in the dropdown). - Select your card type. - Enter your 15/16 digit ICICI Bank Credit Card number and the amount you would like to pay. - You will be securely redirected to the payment interface of your chosen bank. - Your account will get debited instantaneously. - You will receive a Transaction Reference Number on successful completion of transaction. The Economic Times’s web based portfolio service which comes with 128 bit encryption has several features -- Ajax-based front-end, smart search, integrated tax filling, alerts, reminders and more. In addition, it’s absolutely FREE! Be it bulk transaction history or your contract notes, just copy and paste the data in the Easy Upload tool. It will automatically read your data, validate it and upload it in your portfolio. Track stocks, mutual funds, upcoming IPOs, deposits, real estate and even your ESOPs (Employee Stock Option Scheme). It uses 128-bit encryption so you don’t have to worry about your data. View integrated or individual family member’s portfolios with independent access for every family member. Get updates on transactions or important triggers like stocks you find interesting or mutual funds. ET Portfolio Wizard will automatically calculate and export your interest income, dividend income, long-term capital gains and short-term capital gains to the Tax Wizard which makes filing returns simple. Sense prevails. This Government has announced that there is no Government sponsored bailout package for Satyam. This removes the short term cushion on Satyam. One of the Directors of the company is very hopeful of bailing out Satyam from it’s own receivables and bank loans. Nice Idea. It is possible as that Director is known as no nonsense person. But the thing is that even these reputed persons couldn’t able to prevent the present customers opting for new vendors. For the next one year the couldn’t able to get new customers also. Hence Investchips again and again advices you to opt out of Satyam. If you want to invest in IT space, there are plenty of other companies available at reasonable valuations like 3iInfotech, Polaries . In my opinion Infosys is fully valued at it’s current market price. Media reports suggesting that not only Mr. Raju ,most of his Vice-presidents and senior officials resorted to selling of Satyam for the past 6 months. SEBI would investigate and pass the orders only to be over ruled . But one thing nobody can deny. The top level officials of Satyam know the prospects of Satyam more than us. They are better placed in deed. The learned smart officials sold Satyam. What it means? Do you think you are still having reasons to buy Satyam? If you have please please communicate me ithrough the comments. Two thousand crores. This is the amount this Government is mulling to throw it on Satyam. This decision is based on three assumptions. I leave the validity of the above three assumptions to the wisdom of readers. This decision might be seen as a historic blunder. It is not fair also. Government's infusion of capital would be boost the sentiment of Satyam stock and arrest the short term value erosion. But long term outlook remains bleak. Investors should vaoid any exposure. Traders can trade. It seems luck is on trader's side. God bless Poor India. Dr.Manmohan singh may regret this decision later. The newly constituted three member Satyam board met the press today evening. Their immediate agenda being quite naturally to restore the confidence of investors, employees, customers and suppliers.Business continuity is assured. They are going to get extension for publishing Q3 results. Appointment of new auditors to rework last 5 years results and Q3 results. Mr. Deepak Parekh is highly annoyed by the press persons as they are disturbing him through phone calls. He pleaded the press to leave them alone for thinking, making decisions and to produce any meaningful results. He is correct. I think we need to ban "Breaking News" in the interest of the country. TV Channels didn't learn any lessons from their earlier "Mumbai attack" coverage. They are doing great disservice to the nation. Even though quality of Satyam projects are perceived as very high, they may lose some very important clients and employees. The Govt. would face formidable resistance in announcing US like bail out package. It seems some of the important minister's relatives are holding Satyam shares. To salvage them, this Govt. is making "right noises" with different players. SEBI should monitor the unusual price movements of Satyam. As mentioned earlier, Satyam employees should be given time to repay their secured and unsecured loans.Banks should think long term. These well talented individuals with high earning potential would be a asset in long run. But those employees drawing salary of over 1 lakh/month should accept for deferred payment of their monthly remuneration in excess of 1 lakh. Employees may voluntarily reduce their monthly salary by 20-30% for next 6 months to stabilise their company. Other wise there will be a huge imminent job cuts would follow. Even though I trust Mr.Deepak Parekh and his colleagues, it is naive to put our hard earned money on Satyam. We again recommend selling of Satyam. Government has appointed three eminent persons to Satyam Board. There are air of expectations about the implications of this decision on the stock price. Temporarily it may arrest the further decline. But smart investors would tend to dump this company in favour of better managed companies. This decision is good only for its customers and to some of it's employees. We expect massive layoff in this company. It may take atleast 2 years to clear all the mess. Investchips again recommends selling of Satyam. There are plenty of good companies available at reasonable valuations. Please do understand the difference between cheap value and cheap price. If you still want to buy Satyam, then you are either a visionary or an employee of Satyam. May God bless both. What INVESTCHIPS guessed is finally correct. Rough rework of previous financial statement done by India Infoline indicated that Satyam is actually making "material losses at bottom line leavel". For full report, Please click here. Again and again Invest Chips advices you to sell Satyam. True value sof this company should be less than Rs.5 and would soon reach zero. When Global Trust Bank crisis erupts, there were rumors that The Govt. would pay atleast Rs.10/share. But all shares were extinguished. Shareholders got nothing. Present case is just similar to that. Only assets left are their employees. Without good will and working capital they couldn't run the company any longer. SELL. Otherwise perish. ICICI Prudential has recently launched a exclusive website for income tax. It contains FAQ on taxes, tax calculator and ask expert modules. Gives basic information on personal taxation issues. He and the other task force members didn't know about the past financial misstatements till Ramalinga Raju mailed his statements to Board members and exchanges. Even till this time, he didn't know about the real financial status of the company. He told that 36 hours was not sufficient to know the blunders of 10 years. He is not sure that he can give salary to his staffs in Jan 2009. Their investment banker, Bank of America, terminated their association but trying hard to find an investment banker to explore all possibilities including selling of the company. They didn't contact their auditor PwC till now. Like you and me, he also only able to read PwC's press statement from News Papers. None of the business heads and business associates of the company have the privilege to know the overall financial picture. (The fact is that Mr. Ram Mynampati is a board member ,Close confident of Mr.Raju and he must have known the facts). Only CFO office consolidate the same. CFO resigned but the resignation is not accepted. But, Mr. Ram Mynampati expects the CFO would come to office on Monday and explain everything to him. He himself confessed that the entire task force didn't have financial acumen to understand and calculate margins and gross profit. He didn't know the whereabouts of his former chairman ( During the press meet, he referred Raju as chairman only) and assumes that he is in Hyderabad. He didn't know the reasons why his former Chairman chosen to write a unsigned mail (legally not valid)to Board members to reveal very important facts . As he still verifying the facts, he think it is not appropriate to file a police complaint against his former boss. ( For the past 10 years he lied and all believed him. Now he himself made some confessions. But now the company wanted to verify the facts and give time his former chief to device escape routes). The company is still strongly under the control of Ramalinga Raju. They are buying time to destroy legal evidences against Raju. Their main (In fact, only) assets their employees. Raju may have diverted Satyam funds to acquire his real estate investments and for bribing Andhra politicians. Only fools can believe a company like satyam had only 3% margins. In the interest of the welfare of the employees, the company should be merged with Infosys or else be given to Anil Ambani group. Priority should be given to sustaining the company than to punish Raju. Auditing regulations must be made more stringent and more accountable. Role of independent directors should be widened and they be empowered with more legal powers. The entire board including Mr. Ram Mynampati and independent directors should resign in due course to be replaced with ethical and competent individuals. Other software companies should give preference to the retrenched Satyam employees in their new recruitment. Government should announce some EMI holiday packages ( 6months to 1 year) for the loans taken by Satyam employees. Shareholders can sell their shares as no value left at this juncture. I. Period of this package : This package is applicable to only new loans sanctioned upto Rs.20.00 lacs between the period 15.12.2008 to 30.06.2009 (first disbursement) and shall not apply to swapping of loans (take over of loans from other Banks) . iv. Processing charges : No processing charges. These rates are fixed for a period of first 5 years. Reset after 5 years. b) After 5 years, the borrower will have an option to choose between fixed or floating rate, prevailing at that time. c) At the time of switch over no charges would be levied. (from fixed to floating). 2. For the September quarter (Q2) we reported a revenue of Rs 2,700 crore and an operating margin of Rs 649 crore (24 per cent of revenues) as against the actual revenues of Rs 2,112 crore and an actual operating margin of Rs 61 crore (3 per cent of revenue). This has resulted in artificial cash and bank balances going up by Rs 588 crore in Q2 alone. The gap in the balance sheet has arisen purely on account of inflated profits over a period of last several years (limited only to Satyam standalone, books of subsidiaries reflecting true performance). What started as a marginal gap between actual operating profit and the one reflected in the books of accounts continued to grow over the years. It has attained unmanageable proportions as the size of the company operations grew significantly (annualized revenue run rate of Rs 11,276 crore in the September quarter, 2008 and official reserves of Rs 8.392 crore). The differential in the real profits and the one reflected in the books was further accentuated by the fact that the company had to carry additional resources and assets to justify higher level of operations – thereby significantly increasing the costs. Every attempt made to eliminate the gap failed. As the promoters held a small percentage of equity, the concern was the poor performance would result in a takeover, thereby exposing the gap. It was like riding a tiger, not knowing how to get off without being eaten. The aborted Maytas acquisition deal was the last attempt to fill the fictitious assets with real ones. Maytas’ investors were convinced that this is a good divestment opportunity and a strategic fit. Once Satyam’s problem was solved, it was hoped that Maytas payments can be delayed. But that was not to be. What followed in the last several days is common knowledge. 1. That neither myself, not the Managing Director(including our spouses) sold any shares in the last eight years-excepting for a small proportion declared and sold for philanthropic purposes. 2. That in the last two years a net amount of Rs 1,230 crore was arranged to Satyam (not reflected in the books of Satyam) to keep the operations going by resorting to pledging all the promoter shares and raising funds from know sources by giving all kinds of assurances (Statement enclosed, only to the members of the board). Significant dividend payments, acquisitions, capital expenditure to provide for growth did not help matters. Every attempt was made to keep the wheel moving and to ensure prompt payment of salaries to the associates. The last straw was the selling of most of the pledged share by the lenders on account of margin triggers. 3. That neither me, nor the Managing Director took even one rupee/dollar from the company and have not benefited in financial terms on account of the inflated results. 4. None of the board members, past or present, had any knowledge of the situation in which the company is placed. Even business leaders and senior executives in the company, such as Ram Mynampati, Subu D T R Anand, Kesab Panda, Virender Agarwal, A S Murthy, Hari T, S V Krishnan, Vijay Prasad, Manish Mehta, Murali V, Sriram Papani, Kiran Kavale, Joe Lagioia. Ravindra Penu Metsa, Jayaraman and Prabhakar Gupta are unaware of the real situation as against the books of accounts. None of my or managing directors immediate or extended family members has any ideas about these issues. 1) A task force has been formed in the last few days to address the situation arising out of the failed Maytas acquisition attempt. This consists of some of the most accomplished leaders of Satyam: Subu D, T R Anand, Keshab Panda and Virender Aggarwal, representing business functions, and A.S.Murthy, Hari T and Murali V representing support functions. I suggest that Ram Mynampati be made the Chairman of this task force to immediately address some of the operational matters on hand. Ram can also act as an interim CEO reporting to the board. 2) Merrill Lynch can be entrusted with the task of quickly exploring some merger opportunities. 3) You may have a ‘restatement of accounts’ prepared by auditors in light of the facts that I have placed before you. I have promoted and have been associated with Satyam for well over twenty years now. I have seen it grow from few people to 53,000 people, with 185 Fortune 500 companies as customers and operations in 66 countries. Satyam has an excellent leadership and competency base at all levels. I sincerely apologize to all Satyamites and stakeholders who have made Satyam a special organization, for the current situation. I am confident they will stand by the company in this hour of crisis. in light of the above, I fervently appeal to the board to hold together to take some important steps. Mt T R Prasad is well placed to mobalize support from the government at this crucial time. With the hope that members of the Task Force and the financila advisor, Merrill Lynch (now Bank of America) will stand by the company at this crucial hour, I am marking copies of this statement to them as well. Under the circumustances, I am tendering my resignation as the chairman of Satyam and shall continue in this position only till such time the current board is expanded. My contribution is just to ensure enhancement of the board over the next several days or as early as possible. I am now prepared to subject myself to the laws of the land and fact the consequences thereof. BharatMatrimony Group, today announced the launch of the world’s first matrimony channel on the Internet, BharatMatrimony.tv. BharatMatrimony.tv will also be producing capsules covering news, events and developments in the world of marriages.Video clips featuring weddings of topnotch celebrities, fashion, style and bridal wear are also available. Ramalinga Raju, atlast decided to speak satyam ( satyam means truth) but damages already done. I don’t wish to narrate the story again as it is available all through out net. But one thing really surprised me is that some analysts advocated buying of Satyam at Rs.66 today in some business channels (Value uying). Yes. Their argument at that point of time was that the price discounts only 3 times of next year projected earnings. We can at best call this logic as “supreme idiocy” . Nonsense’s. Satyam is a history now. They neither have assets or good-will to continue in the business. Even if you give me Rs.100/share to buy this company, I wouldn’t buy this company. Worth of Satyam shares after Raju’s admissions become zero. If you are one of the poor chaps holding this worthless company, my advice is Sell even at Rs.10. You will not regret your decision. Market would soon recover (from over negative reactions) and move past 3000 as Satyam is thrown out of all Indices including Nifty. Sataym is replaced by Reliance Capital in the Nifty. Till next issue prop up, all media would discuss about corporate governance with out any beneficial effect. Property prices in and around Hydrabad would decline and ICICI Bank and HDFC Bank would loose around 40000 salary customers. Satyam employees may soon default loans they got from banks and financial institutions. So the effects go on and on. So short term pressures may be expected on Reality firms, HDFC, HDFC Bank, and ICICI Bank. The lesson is don’t do bottom fishing in the Bear market. Sell satyam and don’t believe bailout, take over and turn around stories about Satyam. Yes. Satyam is history now. 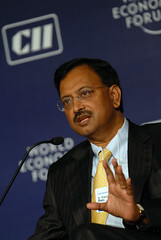 Ramalinga Raju Resigns from Satyam Board. Board alleges that Satyam's balance sheet inflated cash and bank balance of Rs.5040 crores. SEBI also probing his donations to ISB.Ram Myanpati will act as interim CEO, Merrill Lynch can be entrusted to explore. ICICI Bank has entered into an agreement with BSNL Cell One to enable the latter’s customers pay their bills through ICICI Bank’s website. Customers can pay from their bank accounts or credit cards and can view online electronic summary of their bills and can get email alerts before the due date. Bill pay is free service offered by ICICI bank for their customers. To know more, please click here. The Scheme is available to Individuals / Institutions / Corporates / Proprietorship / Partnership / Trust / HUF etc. The customer will have to select the “Core Amount”, at the time of opening the account and deposit the same, initially. Minimum Core Amount is Rs.100/- & Maximum Rs.1,00,000/-. The period of deposit will be from 6 month to 60 months, in multiple of one month. Rate of interest on this scheme will be as per the Term Deposit rate applicable for the period. Interest will be calculated on monthly product basis, for the minimum balance between the10th & last day of the month and will be credited quarterly. The Scheme offers flexibility of depositing monthly instalment amount, by way of Step Up & Step Down options. Depositor can increase (Step up) the monthly installment amount upto 10 times the Core Amount during any month. The installment can also be deposited one or more times, during a month subject to maximum ceiling of 10 times Core Amount. Example: Core Amount Rs.1000/- Customer can deposit maximum upto Rs.10000/- per month. After stepping up the instalment amount, a customer can also reduce the same (Step Down), in any subsequent month/s, but the same should not be less than the Core amount. No penalty will be charged in case of premature closure. Similarly, no penalty will be levied on delayed instalment. Nomination facility is available, like other Deposit Scheme. Loan facility is permitted upto 75 % of the deposit amount, at the time of availing loan, at 2 % ODR. ICICI Bank Offers Free Wrist Watch signed by Shahrukh Khan for their new Privilege Banking Customers. To Know more about this offer, Please Click Here. For eligibility conditions for Privilege Banking , Please Click here. As initial impression of the new policy initiatives unveiled by the central Government favors Public Sector Banks, Automobiles and Infrastructures , the companies in these sectors may gain. You can take positions in PNB, BoB,IVRCL and GMR Infra. Apart from these sectors, the two stocks I am watching are IndiaInfoline and Suzlon. Traders can buy these two stocks for quick gains. All the recomendations are for trading with tight stop loss. Is Mukesh and Anil going to shake hands? Economic Times speculated that both Mukeh and Anil are all set to join together. It is indeed a Great news for the new year. In the changed circumstances, Mukesh controlled companies would suffer without this settlement. But if Indo Pak war errupts, it is the Mukesh who is going to suffer a lot. Hence investment into Reliance and Reliance Petro may be deferred. I am extremely positive on the outlook of RCOM in the year 2009. Accumulate this stock in dips. Avoid private banks as their NPA would increase and margins also would come down. I expect some banks may declare net loss in the year 2009-2010. Another stock to accumulate is GVK POWER. Happy investing.